Is cycling the way forward in reducing traffic congestion in Harrogate and Knaresborough? Residents against the idea of a new road near Nidd Gorge are to deliver 48,000 leaflets before the long-awaited public consultation over proposals to tackle traffic congestion in Harrogate and Knaresborough has already been launched. Claiming "huge support" already, Harrogate and Knaresborough Alliance for Less Traffic (HALT) will launch their campaign with a 48,000 leaflet drop against the proposed ‘relief road’ this Saturday two days before North Yorkshire County Council begins the official consultation. 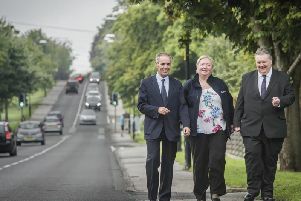 An initiative from the exisiting Nidd Gorge Community Action, HALT's Rachel Christy said the residents group was geared up and ready to put their case for a better future on the roads. She said: "We have 200 volunteers, many of whom will be meeting in Harrogate town centre at 12 noon on Saturday, April 13, before delivering 48 000 leaflets to 28 wards across the district. "We are glad to have a huge amount of support from across the area. Our campaign leaflets, posters and banners have been paid for by a Crowdfunding appeal on our Facebook page." The new alliance of residents is also committed to supporting a holistic approach to reducing traffic and the air pollution it brings by supporting sustainable 'green' measures. Rachel Christy said: "HALT is an alliance of local people opposing a new M62-style 'relief road' between Harrogate and Knaresborough, through the green belt. "We are campaigning for more effective, greener, cheaper, quicker solutions to our traffic congestion that will actually work. "Solutions that will improve our quality of life, preserve the historic character of our towns and protect the natural world for ourselves and for future generations. "It is an extension of NGCA with a holistic approach, looking at the bigger picture, not only the protection of Nidd Gorge." The official consultation, which will be primarily web-based, is launched by the county council on Monday, April 15. The county council's online consultation will be involve 48,000 households in Harrogate and Knaresborough but it will be open to anyone to respond. The council says the online questionnaire, which will include 20 questions in total of a non yes/no variety, is expected to include measures like new cycle paths. But it will include also include a question on what the public thinks about a 150 metre wide corridor identified by the county council already for a potential 'inner relief road' from Bilton to Forest Lane Head going near the sewage works in Bilton but not onto Bilton Lane, past Nidd Gorge but not crossing the River Nidd. The only other new road in a wide range of possible proposals to emerge from the county council's work on the issue is a Killinghall bypass. The idea of a new road running from Bilton has been strongly opposed by the majority of Harrogate Borough Council and Harrogate and Knaresborough MP Andrew Jones after figures in the county council's Harrogate Congestion Study showed it would not substantially reduce traffic in the town centre.